Gamru Rag Rugs - How did it start? It all started when a bag of new scrap fabric was given to the `After School` programme in Gamru which I was managing, by a local Fair Trade tailoring company - Eternal Creation. The children and I made good use of the fabric, including making some rather lovely collages. The fabric was lovely and of good quality and I knew that there must be some other use it could be put to......Then late one evening a long distant memory came flooding back...I was so excited I couldn`t wait to get started the following day.. I remembered when I was a very small child - maybe 4yrs old - watching two of my older sisters making rag rugs from old worn out tattered clothing and used potato sacks; this was during the long British Winter evenings. At the time we had cold concrete floors, no central heating and often woke to the inside of the windows frosted over with ice. We lived in the countryside where my Father worked as a farm labourer. My parents fought constantly to make ends meet. Here in India over 45yrs later I find that half the population (a guess-but it certainly seems that way to me) live lives that could, putting it mildly, be described as well below the poverty line. I had the idea that maybe the local ladies (Mothers of the children at the school) could come and make the rugs to use at home. There would be no charge as I was able to obtain both the fabric and the used hessian sacks free of charge. Two ladies came, Meena and Usha, both of whom had children regularly attending the After School. They were a little sceptical at first, but they persevered and eventually finished a rug together...It looked lovely and they were justifiably proud. I asked them who was going to take it home but neither of them wanted to - I was confused - until they managed to explain to me that they had nowhere to put a `show piece`....I was gutted...absolutely deflated, and at a loss.. However, both were so pleased with their achievement that they wanted to make another one each. When these were finished I managed to persuade them (with great difficulty) to take them home to show their families. 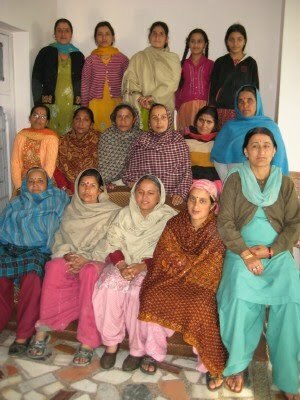 Soon a few more women came, and then some more, until it wasn`t possible to have them all working at the school at the same time, so I rented a big house and gave them the whole of the downstairs. The ladies have now swelled in number to 20, and some of their daughters are also trying their hand - when they`re not doing school work! The rugs have come a long way since the time I watched my sisters making them. They were functional then. Each one is now truly unique; practical, washable, a delight to put your bare feet on and an asset to any home. Each rug is made with love and care and to a very high standard.